A compact apartment with a shared courtyard, set close to the town centre, parking may be available by separate negotiation. Marlborough is a thriving market town lying 8 miles to the west of Hungerford and 18 miles to the west of Newbury with Swindon 11 miles to the north. These regional centres provide a wide range of services complementing those in the town. There are excellent communications with the A4 providing fast access to the M4 at Junction 15 at Swindon and junction 14 at Hungerford and the A303 lies to the south. There are train stations at Swindon, Pewsey, Great Bedwyn and Hungerford all giving fast access to London Paddington. No 12 London Road lies close to an active parade of shops and restaurants and within easy walking distance of the high street of the Town. No 12 comprises a detached period listed property divided into four flats and is of brick and slate construction and is arranged over three floors with a shared courtyard garden to the rear. 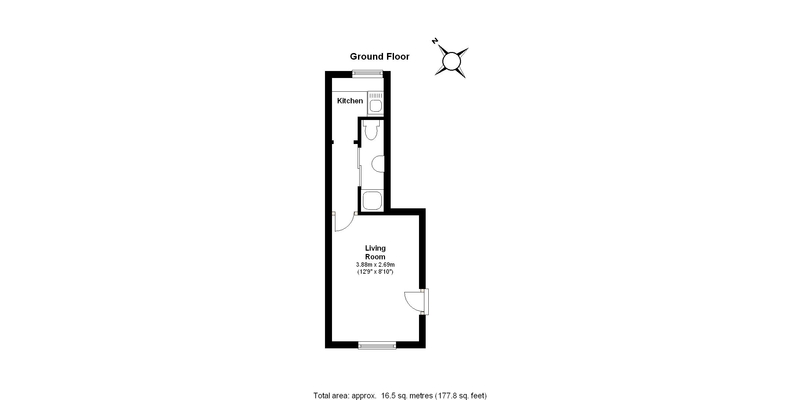 Approached via communal hall and is set on the ground floor No 2 comprises a Studio Bed sit with light wood laminate flooring with an Inner Hall leading to a tiled Shower Room with wc, hand basin and shower and a Kitchen with tiled flooring a range of wall and floor units, a circular steel sink and space for a fridge. There is a dedicated lockable parking space, walking distance from the flat and there is a shared courtyard garden to the rear. Services: electric heating, mains water and drainage, mains electricity. payable by tenant. Charges: referencing fee of £180 and £60 per additional person, including VAT, is charged to the ingoing tenant.